This was both unexpected and great news! 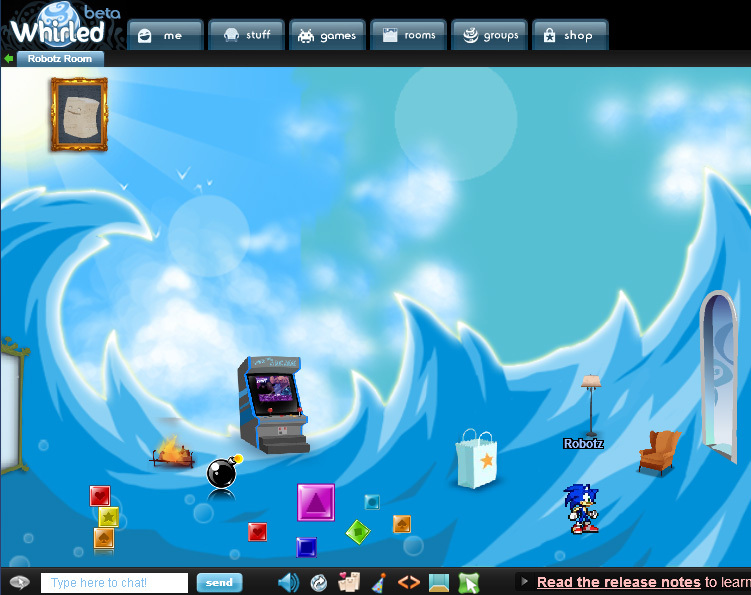 I’ve blogged about Whirled before, the anarchic but beautifully freeform Flash virtual world. They run a quarterly developers competition where games are split into two categorys: multi-player and singer-player. Obviously Kyboi is about as far from a multi-player game as you can get, so that category was out of bounds for me (which is a shame as it has significantly bigger prizes!). But I spent some time making Kyobi Whirled compatible, uploaded it and hoped for the best. And it paid off (thanks Chris/Adam!!) It paid off to the tune of $1000 in fact. You can see all the winning games here. What I find interesting about Whirled is that my game is for sale in the shop there. I get in-world credits from these sales, but I also get my share from the developers bling pool too. The terminology might be a bit “what the hell?” but once you get over the pimp-my-ride lingo it starts to make sense. In short: for as long as your game is on Whirled, and brings people to Whirled, you get a cut of that. This translates into real money. If your game brings people to Whirled and they sign-up, you get 30% of whatever they spend for life. That could add-up significantly, so don’t ignore this fact. You can also sell “furniture”, “backdrops”, “toys” and “avatars” in the Whirled shop. So I pulled apart the graphics from Kyobi, put them into the shop and now they are on sale. Every day people are buying these items. I took the background from my game, changed it a little and now it’s a room background to buy. And people do buy it! I believe this is an easy avenue for income, both real and virtual. Given that you made the assets for your game already, it’s a no-brainer and I’ll certainly be doing it again. Part 2 – Do people REALLY click those sponsor logos? This question gets asked a lot, most recently here on the FlashGameLicense forums. Honestly, I was quite skeptical about it at first. When Kongregate made me a Primary offer for sponsoring Kyobi, the money was paid as an advance on the income these referral links would make. To be brutally honest I took the offer and ran, never expecting to hear anything again. I’m glad to say I completely misjudged this part of the deal and my first months payment was just shy of $800. I will get paid another 2 months worth of referrals before the deal ends. While $800 doesn’t sound like a huge sum of money (and on its own it isn’t) you have to remember Kongregate sponsored the GameJacket version of Kyobi – so not only do I get money from someone clicking “More games” for example, but also from the pre-roll ad at the start. Combine these together and with a really popular game that travels well it can add-up significantly. I consider the total plays Kyobi is getting across all versions to be really good, but there are lots of games that do significantly larger numbers of plays – and if they are being paid per click there is some very serious income potential here too. My advice? Don’t under-estimate these kinds of offers from sponsors. And never under-estimate just how valuable those “more games” links are to your sponsor. People really do click them, in their thousands. So sell your game for a decent price accordingly! Part 3 – Skill Gaming – A great new revenue stream for Flash Developers? On the most basic level Skill Gaming sites are sites that offer payments based on how well you play the game. It’s a form of gambling really, with payouts being based on who else is playing the game, how well they are doing, etc. King.com is an example of a site that makes a seriously large amount of money from this market. But there are many others, and I believe this is a growing sector in more ways that one. At the moment King are sponsoring games left right and center, because they drive large numbers of people to their site – lots of whom then go on to spend real money. Most (if not all?) of the King sponsorship deals are just standard Primary ones though, they pay for branding and your game is a magnet for players to their site. However this is changing – new sites such as SkillAddiction.com are starting that take your game, convert it to be more “skill game” focused and then you can get a percentage of revenue it generates on that site. I have been contacted by two different companies, both of whom want versions of Kyobi for their sites on this basis. There are some factors to consider when it comes to skill gaming – first of all it doesn’t suit all types of game. They have to be quite specific in nature, often they have to be completed within 4-5 minutes, and you have to be able to know the sorts of scores that are possible. For example I’ve had to change Kyobi to make it a lot harder at the start, and to make the play just get progressivly faster until it finally beats you – the current game doesn’t work like this, I inject “breather” levels into the game ever few rounds to give the player a break. But obviously you can’t do this when they are trying to win money. 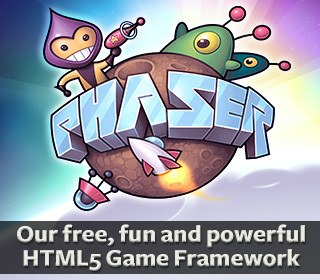 Lots of current skill gaming sites buy-up Flash games just to pad out their sites and draw people in, then they hope those visitors will explore the “other” side of their site. But as I said this is changing, new skill gaming sites are appearing that will use your game directly with the players, offering pay-outs when playing it. And if they offer you a percentage of this then there is massive potential here. Contact the guys at SkilAddiction.com to see if your game would suit their site, it could benefit you. Part 4 – Oberon Media version finally passes QA! They also required a huge load of paperwork to be signed, and contrary to all the other big sponsors (Shockwave, BigFishGames, etc) you have to actually print and post the paperwork to them. Sending via UPS cost me nearly $80. Why they don’t accept it via email like the rest I don’t know. On the plus side once you have sent them one contract you don’t need to post them another in future, should they buy a new game from you. Their payment terms are also extremely poor compared to every other sponsor out there. You are looking at a wait of around 60 days from the date the game goes live across their network. 60 days is an incredibly long time even for standard companies, let alone an indie developer. On the upside of course I don’t rely on this money for anything essential like the mortgage or feeding my family. But if you do then bear this in mind if ever dealing with them. It’s not a deal breaker at all, I’m just saying be aware of it. I also don’t believe the payment should be from the date they release the game. It should be from the date they approve the QA of it, but that’s another story. So why go through all this hassle? because it will place the game across a number of sites with extremely significant visitor figures. They run MySpace games for example. I’d wager that the volume of plays my game gets when it hits the sites they licensed it for will be significant. I’ll report back later in the year to see if my thoughts confirm this. Sadly Oberon don’t offer advertising royalty payments on Flash games (they do for ActiveX/C/Shockwave games). Originally when I first started talking to them it looked like this could be a deal, but things changed internally and it fell away. Had they been able to offer me an ad cut then I actually would have sold the game exclusively to them. Part 5 – Shockwave.com version finished. Now devoid of Nazi imagery! It surprises me that sponsors are still licensing Kyobi. I don’t know why it surprises me, I mean it’s still a fun little game – I guess it’s just the “Flash mindset” where you assume your game is only popular and of interest to sponsors for a month or so, and then is swallowed up in the ever changing tide of new releases. I’m quickly realising this assumption is wrong, and there is actually a bit of a long-tail for game sales, just as in every other medium. The most recent sales was to Shockwave.com, who contacted me via FlashGameLicense (that site is worth every single 10% they ask for!). Their offer was a good one, and the requests were simple. Logo here, few button changes there, basic API for highscores. Then the “Nazi” issue hit. Yes, you read that correctly. If you’ve played Kyobi you’ll know it involves throwing coloured blocks around. Apparently there was an issue with my pink block. The problem was that it featured a triangle. A pink triangle. Highly confused by this being an issue they explained that a pink triangle was what Nazi’s used to brand homosexuals with while in concentration camps. I had always assumed the pink triangle was the gay pride symbol. A little Wikipedia reading later and it confirms both are true. It’s origins are one of the horrific brands used by the Nazi’s, but these days it is more commonly associated with the paramount opposite of this. Also the actual symbol is an inversed triangle. The triangle in my game is the other way up. Anyway, not wanting to be seen to promote Nazi’s in any way at all (even if it feels more like it would be promoting gay pride if anything) I agreed and modified the block, turning it a brown colour instead. So there you have it – the Shockwave version should be released on May 12th and will be 100% cute girl and Nazi-branding free! If you’re going to sell a game to Shockwave be prepared for artistic change requests, and whatever you do avoid any of these shape/colour combinations! I reported last time that the iPhone version of Kyobi was enjoying success thanks to a promotion on the hit game iDare. I wondered if this might just be a flash in the pan, or if the sales rate would be sustained. Thankfully it’s still going strong and shifting 3 digits worth of copies per day. The amount varies a lot, but averages at around 250 sales a day, with the usual peaks and troughs you’d expect. I don’t know for how much longer this will last of course, but it does mean I’ll see at least one months worth of decent royalty payments from it. And of course it won’t ever stop selling, it’ll just reduce back to a much lower rate – but even this will ensure a nice small payment coming in each month. Wow, I had no idea this would turn out to be such a long piece when I started. I could probably have broken it into 6 different blog posts. But if you got this far (and actually read up to here rather than scrolled) then thanks and I hope you found it interesting and some of it useful. Factoring in new sponsored versions of Kyobi, the unexpected Kongregate payment, the Whirled prize money and money I know I’ll receive from iPhone sales so far, I can report that this one little game has now netted me $10,105. I know there will be more iPhone and Kongregate payments to come over the next two months (although I expect them to be lower). And maybe another portal may even buy it, who knows? I’ve learnt an awful lot from this one game. Things I will take into my next game for certain. The Whirled link-ups, the possibility of skill gaming revenue share, not to under-estimate referal payment offers and the long-tail of sales. 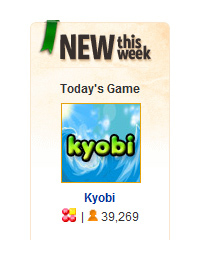 My match-3 physics game Kyobi went live onto BigFishGames today, and is currently sitting proud as the #1 game in the Online charts. At the time of writing it has a staggering 40,000 people currently playing it. I mean, whoa. That’s pretty incredible. That’s like the entire population of my home town all playing my game at the same time. I’m not sure how often the player count is updated, but it seems to be every minute. Adding those stats into the mix the game has reached 1 million plays since release just under a month ago, and it’s not even out on the really big sites I’ve sold it to. When I put Kyobi onto FlashGameLicense.com (FGL) the interest was immediate and rapid. As well as having it on FGL I also spent time emailing sponsors directly. Most of them didn’t bother to reply, but 2 did and both bought licenses, so it was worth my time just for this. One of companies who contacted me was GameJacket, who offered a $1000 advertising advance on the basis that all other versions of the game I sold were site locked (which they of course are), and no-one else got the game before them. I liked the sound of this offer. I was low risk to me, so I accepted it. This automatically meant that none of the other sponsors could have exclusive rights to the game. So I told them this and most of them re-adjusted their bids accordingly, understanding that they would get the game on the day of release, but on a non-exclusive basis. In effect, everyone got it at the same time. So I persisted with this offer to the various sponsors and they all agreeded. I built custom versions for them all, with API work in some cases, custom logos and pre-loaders in others. All versions were packaged up and ready for launch day. I also created a Media Pack they could download. This pack included a range of high resolution screen shots, game artwork, logo, description and thumbnails for them to use on their sites if they wished (and a number of them did). To date I have sold Kyobi to 9 different sponsors. 5 of those had the game on day of release, 2 others contacted me directly as a result of having seen it on NewGrounds (where it got a Daily 5th Place Award) and asked for custom builds. The other 2 bought it via the FGL game shop service. Updated: 26th April (5 days after original article written) – Kyobi won 3rd place in the Whirled single player game contest, adding $1000. It has also been picked up by another 2 sponsors adding $600 to the figure below. Combined I received $5,155 $6,755 (updated 26th April) from these deals. By making a lot of “smaller” sales I managed to effectively double what I would have got from the best “single sponsor” offer had I gone down that route. And of course the game is still on sale. You can see some of the custom builds of Kyobi on Andkon Arcade, Hubits, Juegos Juegos, Whirled and even a dating site called Connecting Singles! A tie-in with GameJacket means a special version will also go across the Spil Group of sites shortly too. 2 very high profile sponsors are yet to release their versions, despite having had them for some weeks now. I’ll update when they do because I expect them both to deliver serious play figures. Of course the GameJacket version carries adverts, and the daily income rate from those has been quite encouraging (at least compared to my experience with Mochi). It won’t set my financial world on fire, but it should earn back the $1000 advance relatively painlessly. And then the money from that point on goes directly to me. As I have a full-time job that I love, that pays all the bills money made by Kyobi is surplus income. After tax it helped pay towards a new kitchen and parts for me to build a top of the line Quad Core PC. Could I “live off” the income from this game? No, of course not. That is what Flash game dev contract work is for, but that’s another post for another day. … and what about the iPhone version? Kyobi was converted to the iPhone by my good friends at The Game Creators. The iPhone version is enhanced in several ways. 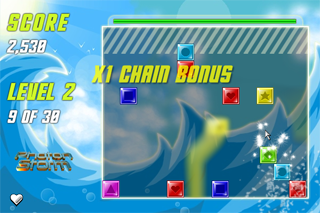 It has a nice use of the accelerometer, more complex level patterns, blockers, bonuses and power-ups which improve the gameplay significantly. In short it’s a really nice game, and my agreement with TGC meant I’d get a decent percentage from sales. On the downside they renamed it from Kyobi to “Touch & Go”. In retrospect this was a horrendous move. Not only did it disjoint the brand, if you try searching for it on AppStore you’ll get about a million results back thanks to the generic title (have a guess how many AppStore games have the word “touch” somewhere in them! yeah, it’s a lot). Even direct searching for the exact title barely reveals the game. It was quite literally impossible to find. The GameJacket release carried an advert for the iPhone game at the end, which helped lead to some small sales figures, but quite frankly nothing I could ever retire on. It was far removed from the “iPhone $$$ dream” the media hypes, to say the least. A “Lite” version was also released to help shift things along, but it of course suffered the same “invisible to search” problem. So I pretty much wrote it off as a bad experience and forgot about it. That was until iDare hit the scene. 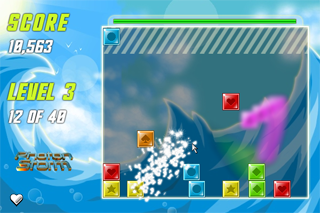 iDare is a free game TGC created over the course of 3 days. If you are old enough to remember the classic sci-fi film Aliens, you’ll remember the scene where the android Bishop holds down Hudsons hand on the dinner table, and spreads his fingers out and proceeds to stab a knife between his fingers as quickly as possible. School kids worldwide at the time re-created this using everything from pencils to protractors! iDare is basically an iPhone version of this crazy game. It’s good fun, it’s original and it is free. Since release it has gone absolutely ballistic. Currently #1 in the UK charts and #2 in the Canadian charts and#4 in the US charts and still climbing – that is out of ALL free downloadable apps on AppStore. The net result of this is over 600,000 downloads since release and increasing every day. Edit Update: As of today (April 26th) iDare now has over 1.2 million downloads. What does this have to do with Kyobi? Very simple: iDare was created with the express purpose of advertising the other games TGC had made, including mine. I cannot give any specific sales data, but suffice to say that Touch & Go has gone from being flat-lined at a few sales per week, to selling 3 digits worth of copies per day (and the first digit is > 1). And of course the more it sells, the higher it climbs up the charts. And the higher up the charts it goes, the more it sells. It’s currently #19 in Strategy titles and edging ever closer to the magic Top #100 games. If it manages to hit that mark TGC and I will be very happy indeed. At the moment direct income from the Flash version is greater than that of the iPhone one – but at current projections this could be reversed shortly. I’ll keep you all updated. Ensure your game title and description is AppStore SEO friendly! Avoid this part at your peril. Don’t assume that just by existing on AppStore you’ll make any money at all. You need a method of promotion. Find what works for you. “Lite” versions are mandatory now. Create one. But again, the “free” app space there is flooded, so don’t assume just because you have one that “Full” version sales will increase dramatically. They won’t, but it will help. Promote, promote, promote! Find a way to pimp your game as best you can. If you don’t it will sink without trace, no matter how excellent it may be. If you have no promotion strategy then don’t invest a dime into your iPhone game. Just having a Flash version of the game doesn’t mean you’ll dramatically increase iPhone sales – yes the sales do cross over, but the conversion rate was pretty tiny for this game. Hopefully yours will fare better. Talk about what you are doing! Blog about your game, tweet about it, Facebook wall it, YouTube it, put screen shots on Flickr, write about it in forums. Do the whole social works. If you do this well enough it’s possible to build up a good “following” before the game is released, leading to an initial flux of sales that will give it a little kick-start up the App charts. Cross promote. If you know another iPhone game doing well, and know the developer, ask if they’d be willing to sell you some “ad space”. It could pay dividends. Be realistic. Even with a #1 AppStore download promoting your game, Apple still won’t be sending trucks full of gold bullion your way. That moment is gone. Live with it and set realistic goals, you’re in hell of a competitive market place. 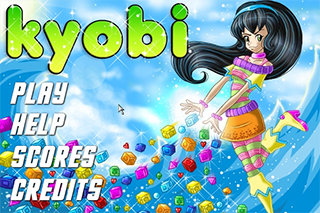 I’m pleased to announce that my latest game ‘Kyobi‘ is now available for the iPhone / iPod Touch from the Apple AppStore. The iPhone version was developed by The Game Creators. 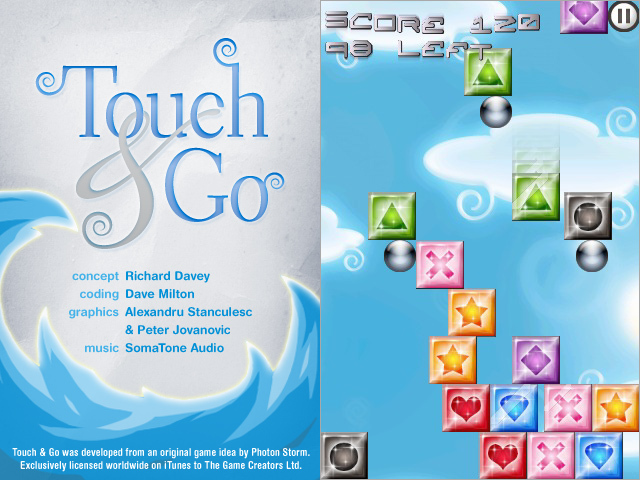 It has been re-branded as “Touch & Go” with a new set of graphics more suitable for playing with your fingers. Touch & Go is available as a free Lite version and the full version costing £1.79 / $2.99. Today I managed to get time to finish-off and release my new game, Kyobi, onto FlashGameLicense.com. The game is best described as a cross between Columns, Tetris and a Match-3, but with a big fat dose of physics thrown in for good measure. As the blocks drop you can grab them with the mouse, and fling them around. Match 3 or more of the same colour and they all explode in a shower of particles. I am really pleased with how this game plays. I spent a lot of evenings working on tweaking the difficulty, so the first 20 levels guide you through the game. The pace ebbs and flows gracefully. After a really hectic level with 6 blocks falling every couple of seconds, the next level can often be far more sedate with a slow trickle to give you a breather. Basic game AI controls level progression there-after, ensuring the game doesn’t just get faster and faster (which would be no fun for anyone). The game uses my new PixelBlitz physics classes through-out. At the time of writing this Kyobi is up for bidding on FlashGameLicense.com. 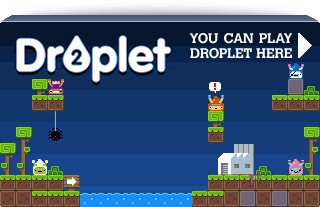 If you have a Developer account there (or are one of my FGL friends) you can play it here. Everyone else I’m afraid you’ll have to wait until it goes public, sorry!